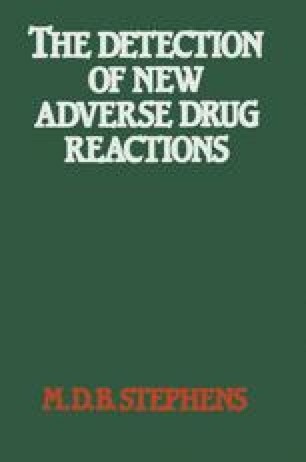 The first important therapeutic disaster which prompted the world to demand a better system for the detection of adverse drug reactions (A.D.R.) was thalidomide phocomelia, first mentioned in The Lancet of 2nd December 19611, and this was later reinforced by the practolol disaster in 19752. It has been claimed that the side effects of practolol would have been discovered much earlier, had the adverse events in the early clinical trials been reported more fully3,4. Present pre-marketing clinical trials often fail to discover what are subsequently known to be important side effects5,6, as witnessed by the events with Opren (benoxaprofen) and Zomax (zomepirac). The final destination of the data collected on adverse events from pre-marketing clinical trials is the licensing authority and one of these has commented that the information on adverse effects submitted by drug companies is often of poor quality5. Even in early clinical trials (Phase II), not all adverse effects are reported7.